Despite the Delhi Government stating that education figures have “tremendously improved in Delhi government schools”, “fundamental issues in the education system” in the past five years show a “disturbing trend” as per a NGO report based on RTI queries and a three-month perception survey. A new #trending video doing the rounds on Twitter is ‘Ground Reality of Delhi Govt Schools Jumla or Truth? By Dhruv Rathee’ uploaded on YouTube that conducts a check on a model government school in Delhi. The video that has more than four lakh views also lists that 54 such model schools have been created after 2016, 8,000 classrooms have been renovated and 12,000 more are likely to be renovated by mid-2020. Clearly, the presenter in the video looks “impressed” by the infrastructural developments in the school visited. Delhi’s education budget also received a big boost with the highest ever education budget being allocated for the year 2019-20 with 26 per cent share of the total budget. However, “fundamental issues in the education system in Delhi Government Schools” in the past five years show a “disturbing trend” as per ‘State of (Public) School Education in Delhi’ white paper report. Brought out by NGO Praja Foundation on the basis of data obtained and compiled on the basis of Right to Information (RTI) Act and a perception survey, the report notes that in the past five years from 2013-18, enrolments in MCD schools have “fallen from 8,69,540 in 2013-14 to 7,24,627 in 2017-18. 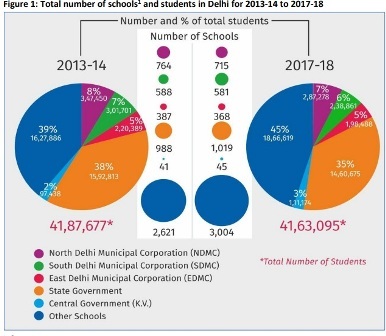 “While share of enrolments in state government schools to total students has fallen from 38 per cent to 35 per cent, enrolment in other schools including Delhi Cantonment Board and DOE Aided among others has risen from 39 per cent to 45 per cent”. As per the report, Class 1 enrolments in MCD schools have fallen by 43 per cent, from 1,69,215 in 2010-11 to 95,817 in 2017-18. If the current trend continues, according to the report’s time series analysis, “enrolments are further expected to drop to 37,938 (fall of 78 per cent) by 2020-21”. Nitai Mehta, Managing Trustee, Praja Foundation, notes in the report’s foreword that “claims made by the government of high passing rates over the years were actually achieved by failing nearly half of the students in Class 9 and almost one third in Class 11”. The report is also critical of the state’s correspondence education scheme ‘Patrachar’ which is meant for students who have failed in class eighth or ninth but can apply for giving the board examination of class 10th through correspondence. “The enrolment for Patrachar in 2017-18 in class 10th was only 2,830 students, only two per cent of the 1,72,995 students who dropped out of the state government schools,” notes the report. The report released in the 10th year of the implementation of Right of Children to Free and Compulsory Education (RTE) Act, also states that only four per cent was the average pass percentage of students in the past five years under Patrachar. “In 2016-17, under the Chunauti Scheme, students who had repeatedly failed in class ninth were directly shifted to Patrachar in class 10th as ‘Vishwas Group’, however of these only two per cent passed the board examination,” the report points out. “The scheme is not even able to achieve its primary aim of enabling prior failed students to pass in board examinations,” it reads. The report only indicates the numbers of students dropping out but analyses the “poor leaning outcomes of students over the years”. “Whereas in class ninth, more than half of the students did not move to secondary education level through examinations as in primary and middle school, they were promoted irrespective of learning levels. With the recent amendment to the RTE Act, students would now be liable to be failed in class fifth and class eighth too”. “This is a disgraceful situation as despite the state allocating huge amount of financial resources (Rs.75,056 per child for 2018-19), the future of lakhs of students is at stake,” writes Mehta. Based on the RTI queries, the report notes that 40 per cent of Aam Aadmi Party MLAs did not raise even a single issue on education from March 2017 to January 2018. In MCD, only 11 per cent of total councillors in 2017-18 raised more than 10 issues of which 62 per cent were from BJP, 21 per cent from AAP and 17 per cent from INC. Reportedly, AAP MLAs have dismissed the report and have said that the “report is a case of political vendetta”. As per the perception survey conducted in April-June 2018 across Delhi in which 28,624 households participated, out of the total sample size, 2,657 households had children in the age group of 6-14 years out of which 2,611 had children going to school. “Eighty four per cent of the respondents from government schools said they would want to change their schools, affordability was the biggest hindrance” for 77 per cent of them even as “overall satisfaction with the school is the lowest for schools run by the local body (24 per cent)”.